Going to Sleep: Bedtime Tips for Toddlers and Children with Sensory Issues, or Who Just Have Trouble Falling Asleep! Quality sleep is crucial for quality functioning, and yet we are a sleep-deprived culture. Adults drink coffee and push themselves past their tiredness, while children will naturally push themselves to be more alert and then not be able to calm down. Children with sensory processing issues usually have poor self-regulation, meaning they can’t easily bring themselves from one state of alertness to another. When tired or feeling lethargic, they will rev up to a hyperactive state and remain there. They may even endanger themselves as they get toward bedtime and become more giddy and unmindful of where their body is in relation to people and objects. Accidents are more likely to occur just before bedtime when kids are getting wired as they are getting tired. 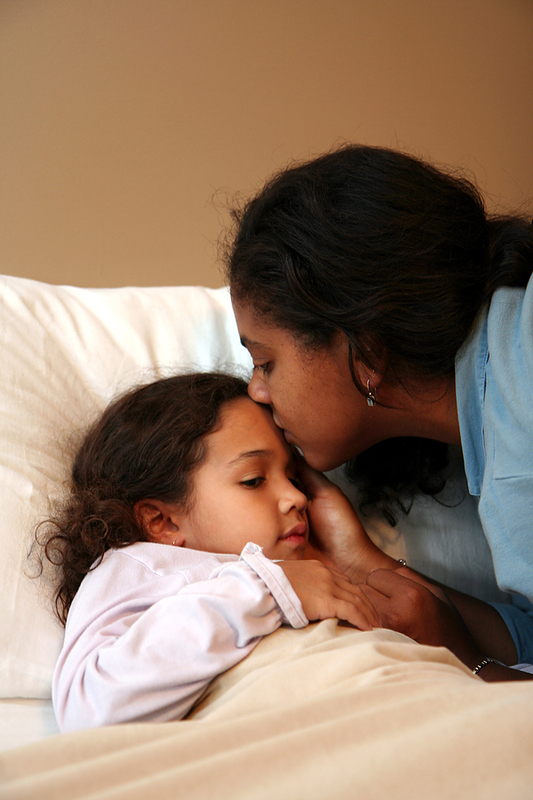 Making bedtime for children with sensory issues drama-free and easy can be a challenge. Going to sleep will be easier for your child with sensory issues if you ease the transition with a predictable, calming bedtime routine. For safety’s sake, and to get kids in bed on time to get the necessary amount of sleep, begin the children’s bedtime routine at least 30 minutes before their actual bedtime, if not longer. A few minutes between the announcement that it is time to go to sleep and lights out is not enough time for a sensory child’s body to adjust. Turn off the television and DVD early. Both are hypnotizing and overstimulating. The minutes will slip away as your child watches “just this last scene” and the next, and the next. Dim the lights. The bright lighting that is right for playing with toys in the bedroom is too stimulating before bedtime. Read bedtime stories by lamplight not by a bright overhead light. Install dimmer switches so it’s easier to bring the level of light down as your child’s bedtime approaches. Stick to a routine. The bedtime routine should include toothbrushing and putting on pajamas, and perhaps a bedtime story and a bath (note that bath time at night is too stimulating for some sensory kids). Many sensory kids have an easier time settling down if they perform each of these tasks in order. A visual To Do list made of stick figures, or a simple list for a child who can read, can help make the abstract agenda concrete: “Oh, I did that, now I have to do that.” Use a Time Timer® to show him when the lights will be turned out. Making time visible using a device like the Time Timer® can help a lot! Winding Down. It can be tempting to turn on a television or put on a beloved DVD or video for your child to help her wind down before bed, but a better option is to read a book to her and discuss the events of the day in a loving and supportive way. Let your child pick a favorite story or nonfiction book. If you’re bored with the same old one, exercise your creativity. Can you alter your voice, ask your child questions, and encourage her to sound out words and read them? You might also review significant events of the day in a positive way. For instance, if your child pitched a fit after school because she had to go to the dentist, talk it through and validate her feelings, and have a short discussion on how to make things easier the next time she has an appointment. Help her to go to sleep believing that tomorrow she will do better, with your support. Block background noise. Close doors so she can’t hear the television or a conversation going on in another room. Consider using a fan (not necessarily blowing on your child, just “on”), aquarium, white noise machine, soft music, or even a radio turned to static to block out background noise that will keep her awake. You don’t want your child to get used to dead silence before bed if you can help it, but you also don’t want to make it very difficult for her to fall asleep because of all the activity going on in your home. Turn the television down in the living room or family room, close doors, and listen when your child says, “It’s too noisy and I can’t sleep!” Keep in mind that auditory listening programs such as Therapeutic Listening and The Listening Program can make it easier for your child’s brain to develop the ability to block background noise. Provide deep pressure input. It may help if you massage her limbs, squeezing them gently and then releasing, to calm her body. You can teach her to tighten her muscles, then release them, body part by body part, in order to self-calm any time she needs to go from an alert to calm, or sleeping, state. She may need hugging, pillows pressed against her, or a weighted blanket to help her body to fall asleep. If you want to use a weighted blanket, consult a sensory smart OT about the proper weight and use. Or, use heavy cotton blankets, if they don’t make your child too warm. All of these strategies will help your child with sensory issues relax his system and have an easier time transitioning from an alert to a calm, then asleep, state. Goodnight, Moon by Margaret Wise Brown. Look for where the mouse is hiding on each page. Richard Scarry’s Cars and Trucks and Things That Go. Look for where the yellow bug is hiding on each page. Talk about the many cars and motorcycles, and what Lowly the Worm is doing. Go Away, Big Green Monster! By Ed Emberley. This clever book allows a child a sense of control over a scary green monster, easing anxieties and reminding him that he is safe. I especially recommend this one for anxious children. Pat the Bunny by Dorothy Kunhardt. This sweet storybook features textures, a mini mirror, and other interesting interactive features. It’s Okay to Be Different, and other titles, by Todd Parr. These gentle, humorous books have bold graphics and simple, whimsical storylines about how it’s okay to be different, to have feelings, and so on. The I’m Not Scared Book is especially good for kids who need to talk about their fears and anxieties. NEW WEBSITE AND BLOG! If you liked this article, PLEASE come join me at the new www.SensorySmartParent.com and sign up for my NEW newsletter and blog. Thanks! Great tips. Thanks for sharing! Will pass along to some of our parents. Pingback: Going to Sleep: Bedtime Tips for Toddlers and Children with Sensory Issues, or Who Just Have Trouble Falling Asleep! Thanks for this great article! Leaving the T.V. off at night and encouraging less stimulating activities (coloring, drawing, family read-aloud) has been crucial in getting our son to fall asleep. I always give my kids a warm bath every evening to make them feel relaxed. Then I read then a story or we sing songs. I leave the hall landing on sometimes but close their bedroom doors. I find this works well and I also give them warm milk at teatime and they always have water available by their beds. This is great. Wll share on my blog too at some point! Any tips on getting a child with sensory processing issues back to sleep when he wakes in the middle of the night and is awake between 1 and 4 hours?? First, make sure he’s not consuming caffeinated beverages (root beer and Mountain Dew-type sodas are two beverages with hidden caffeine). This will definitely disrupt sleep. Second, if none of these sleep hygeine tips work to keep him asleep, try using a weighted blanket when he wakes up to get him to fall asleep again. A sensory smart OT can advise you on the proper weight and whether you can leave it on him for the rest of the night. If he’s on medications, it may be related to that. Thanks. He’s not having any kind of those beverages and we’ve tried a weighted blanket. He’s currently taking melatonin which is getting him to sleep but doesn’t get him through the night. My son is 5 years old and has cerebral palsy.